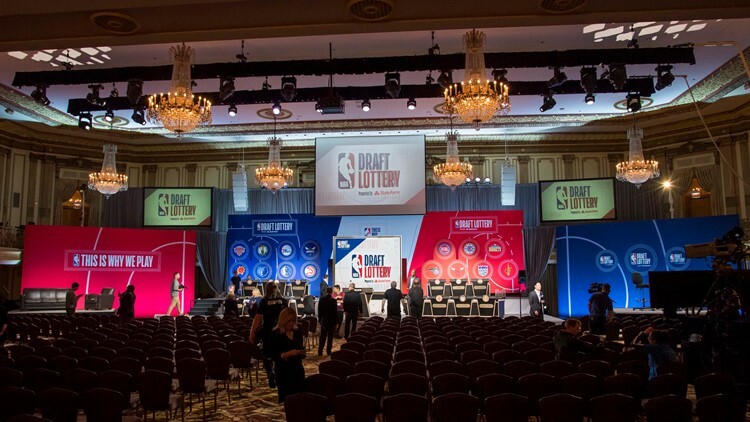 A general wide view of the stage is seen prior to the 2018 NBA Draft Lottery at the Palmer House Hilton in Chicago, Illinois. The Phoenix Suns had the worst record in the NBA during 2017-2018 regular season, but help is on the way for the organization. The Suns entered the 2018 NBA Draft Lottery with the best odds of winning the No. 1 overall pick, and that is exactly what they did at the Palmer House Hilton Hotel in Chicago on Tuesday night. The Suns have never made the No. 1 overall pick in the NBA Draft, but have made top-five selections on nine occasions, including the No. 4 choice in each of the last two years and the No. 5 pick during the 2013 NBA Draft.